You’ve probably had a glass of wine after a long and stressful day. Many of us have. But for 15.1 million adults in the United States, this one glass of wine has become an alcohol use disorder that is harder to control. And among those struggling with addiction to alcohol, an estimated 80,000 people lose their life to it each year. The numbers are devastating, but there are ways you can help. This article will help you determine if you or someone you know is struggling with alcohol use disorder and how you can reach out to get them the support they need. 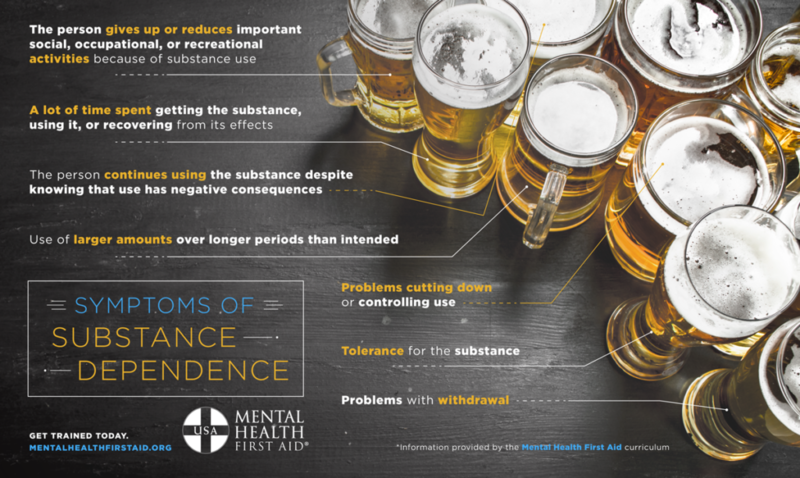 If you suspect someone is struggling with alcohol use disorder, Mental Health First Aid can help. ASSESS for risk of suicide or harm: If you are concerned about someone’s drinking, talk to the person about it openly and honestly in a quiet and private environment. If they’re experiencing an extreme level of crisis, including alcohol poisoning, aggressive behavior, suicidal thoughts or non-suicidal self-injury, call 911. LISTEN nonjudgmentally: If the person isn’t in a crisis, ask about their drinking habits and if they feel in control. During your conversation, consider the person’s perception of their drinking, readiness to talk and ability to recall events. GIVE reassurance and information: Treat the person with respect and dignity. Interacting with them in a supportive way instead of threatening or confronting them will help keep the conversation going and the person listening. Remember to have realistic expectations. Major behavior changes take time to achieve and often involve the person going through a number of stages. This conversation is the first step to open the door to a road to recovery. ENCOURAGE appropriate professional help: If the person is willing to seek professional help, give them information about local options and encourage them to make an appointment. Primary care physicians, drug and alcohol specialists, mental health professionals and certified peer specialists can provide help to a person with alcohol problems. If the person isn’t sure about what they want to do, encourage them to start with a conversation with a primary care physician and take it step by step. ENCOURAGE self-help and other support strategies: Encourage the person to reach out to family and friends who support their efforts to change their drinking behaviors and to spend more time with supportive nondrinking friends or family. There are also many groups that support people recovering from alcohol use disorder, including 12-step programs like Alcoholics Anonymous (AA), self-help groups and support groups for families like Al-Anon and Adult Children of Alcoholics. To learn more about to help someone struggling with an alcohol use disorder, take a Mental Health First Aid course today. The course will teach you how to identify, understand and respond to signs of alcohol or substance use disorder. Together, we can support each other and #BeTheDifference on the road to recovery.